Tonight’s gig at the Garage was headlined by Gloryhammer, with supports coming from Dendera and Darkest era (who have been the supports on the whole UK tour) plus a local support band, Death Valley Knights. Death Valley Knights opened the night with a very good set. When a 4 band bill starts with a band this good then you know it’s going to be a great night. A London band (but with an American singer) they’ve got a great metal sound influenced by the old-school greats – Judas Priest, Iron Maiden, Accept and more. Definitely a band worth checking out if you get the chance. Dendera were next up. I’d heard good things about this band, so was looking forward to hearing them for myself. Like their label-mates Iron Knights (formerly known as Stuka Squadron) they have a sound that’s heavily influenced by Iron Maiden. They put in a very strong performance and certainly went down well with the crowd. 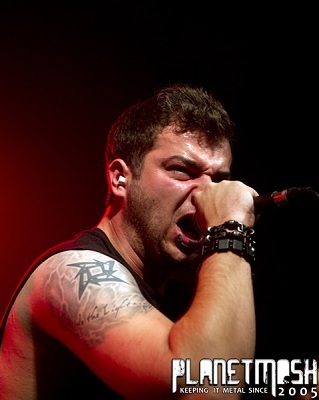 Darkest Era were up next. They’ve got a heavier sound which is fairly traditional heavy metal but with a Celtic influence to it. Until tonight I’d never heard anything by them, but was really impressed by what I heard – they sounded great, and put in a really impressive performance. Their album has been out a couple of years, and their next album is likely to be next year – I for one can’t wait to hear it. Despite the support bands all having been very good, tonight was definitely Gloryhammer’s night. Even before they started, fans were waving inflatable hammers and inflatable swords in the air. Before they started though came a selection of Hammer related songs – MC Hammer’s “Can’t touch this”, Queen’s “Hammer to fall” and a few others, plus they also played the Alestorm cover of the Village People hit “In the Navy” (which sounded a lot better than I was expecting). Gloryhammer took to the stage in front of a decent sized crowd to huge cheers and after the intro (Anstruther’s dark prophecy), they kicked off with “The unicorn invasion of Dundee” before playing the rest of the album in order. It works really well – the songs flow well musically and also tell a story so playing it in a different order wouldn’t work so well. 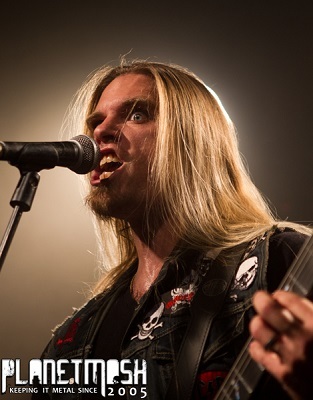 Singer Thomas Winkler is a superb power metal frontman as well as singer. He gets the crowd obeying his commands – cheering and throwing their arms in the air, booing the evil wizard Zargothrax (aka Chris Bowes), and of course the almost obligatory splitting the crowd into two halves and getting each to sing louder than the other. The rest of the band put in great performances too – the band is really tight and polished musically, and they look to be having a great time on stage too. Alestorm singer Chris Bowes seems to be thoroughly enjoying playing the part of the evil wizard as he plays keyboards dressed in his robes, and the rest of the band are also in costume. The set ends with the last track from the album, as you’d expect, and for the encore they play the bonus track from the limited edition version of the album – “Wizards”, which apparently sets the scene for the next album being in space. Power metal can sometimes be pretty cheesy, but with Gloryhammer they take that to new heights, but you can’t help enjoying every second of it. The band’s album “Tales from the Kingdom of Fife” is still in my opinion the best power metal album of the year, and it’s great to see the band are just as good if not better when playing live. I for one can’t wait for the next Gloryhammer album, but sadly that’s likely to be a year or more away.